The local economy is based upon agriculture. It is known for its strawberries, peaches, apples, garlic and potatoes. Constanza it is also known for its wide variety of flowers, especially its roses. 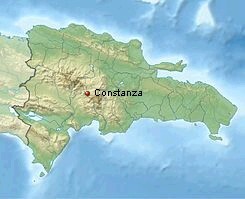 The name of Constanza has its origin in the legend the daughter of a local taino cacique whom lived in the valley. In 1852, the British explorer and consul Sir Robert Hermann Schomburgk mentions the existence of a farm in the valley of Constanza. The town was formally founded in 1894. In September 9, 1907 the town was incorporated into a municipality in the province of La Vega. In June 14, 1959 a plane landed in an airstrip with more than forty rebels with the purpose of deposing the dictator Rafael Leonidas Trujillo Molina. They fought guerrillas in the nearby mountains, and after two months against the Dominican Army managed to end the rebellion.